For a lot of pet owners, the ID tag is more of an accessory. It is something they get because it looks cute or cool. That is one side of the story. In fact, all pet owners should get an ID tag mainly for their functional purpose and that is identification. In order for an ID tag to be useful, theoretically, it should be engraved with personal data such as the pet name, owner phone number or even a physical address. On the other hand, even a simple ID tag with a generic writing can be useful because it can be used for identification just as they are. Now that the functional use of an ID tag has been cleared, it is time to find something suitable for the pet and owner. There are plenty of designs to choose from and a lot of sellers are willing to personalize them. Out of all of them, we could only pick 10. 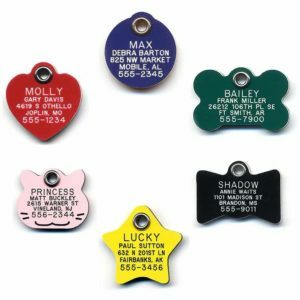 Here are the top 10 best pet ID tags in 2019.
io tags is a small company that makes custom pet ID tags. They offer simple models in the shape of a paw for a low price tag and decent quality with attention to detail. 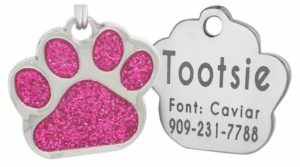 Their Glitter Paw pet ID tag is a great pick for every pet owner that does not mind a more glamorous design. On the back of the ID tag, the manufacturers used small stones that make it look like jewelry. GoTags makes some rather interesting ID tags for both cats and dogs. Their plastic ID tag is actually made with a glow in the dark edge that makes it easy to spot. It is an extra feature that will prove to be more than useful in certain situation. Build quality is reasonable, although some might prefer a metal ID plate. The tags can be customized with up to 8 lines of text. 4 lines go on the front and 4 go on the back. The GoTags quick clip pet ID tag is both practical and functional. It is a simple tag shaped like a bone that comes with a special clip. The clip makes it very easy to attach to a collar and stays on properly in place due to the spring loaded clips. Customization is possible for this particular dog tag. It can have 4 lines of text on one side and another 4 on the other side. Customization is offered at no extra charge by GoTags. In terms of construction, both the ID tag and the clip are made out of stainless steel with a chrome finish. This makes it rust resistant and durable in time. It is also not that heavy and will not cause discomfort for the pet in any way. GoTags Swarovski pet ID tag can be considered a luxury model. It actually has genuine Swarovski crystals around the edges. This gives it a more distinctive look that simply makes it stand out compared to other ID tags. The tag itself is made out of metal but it has a painted finish. In fact, it is available in 6 different colors including blue, purple, pink, black, red and silver. The crystals are all clear so that they can reflect light better. LuckyPet plastic pet ID tag is not as bad as some would think. It is made from a thick and hard plastic material that will survive even if the pet chews on it. The fact that it is made out of plastic does make it easier to customize. Speaking of customization, LuckyPet can make the ID tags with 5 lines of text on the front that can be the pet name, a full address, and a phone number. When ordering, the customization process has proved to be extremely simple. As far as design goes, the ID tags are made in 6 different shapes and 7 colors. All of them are durable, lightweight and can have the same amount of text printed on them. 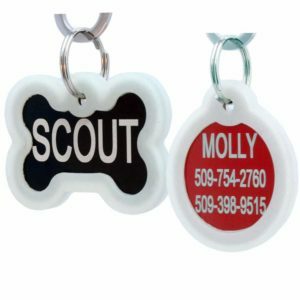 GoTags round customer pet ID tag is one of their more popular offerings. It is a simple ID tag that looks great and can be customized in any way the owner desires. The ID tag is also not that expensive and delivery is quite fast. The rounded ID tag can have various designs on one side and 4 lines of text on the other side. With a simple customization process, creating the ideal ID tag takes just a couple of minutes. 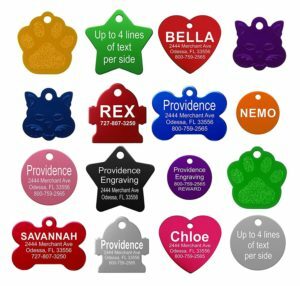 Providence Engraving makes inexpensive personalized pet ID tags. Their customization process is straightforward and delivery is quite fast. 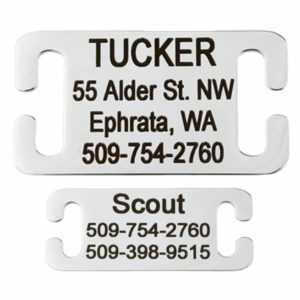 The tags they offer are made to be spotted easily and durable using aluminum. Aluminum is a soft material but for an ID tag, it should not matter all that much. The tags can have 4 lines of text on one side that can contain the pet name, address, and a contact phone number. The tags themselves are available in a wide range of shapes and colors. They are fairly small but easy to read. As they are also inexpensive, it is difficult to find a better deal. GoTags Slide-On pet ID tags are great for all owners that truly care about their pets. They are suitable for both dogs and cats. The way the tags are designed makes them easy to place on a collar. Being made out of stainless steel makes the ID tags quite durable and stylish. Their sliding design makes them sit tightly on the collar instead of hanging. This also means that they are available only with one design. As most other pet tags, they can be personalized. The tags can have up to 4 lines of text on the front. No text can be added on the back side which would actually be difficult to read when the tag is placed onto the collar. 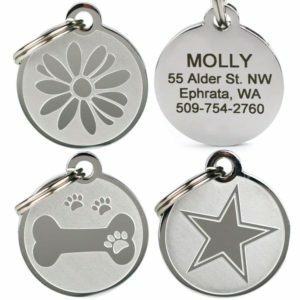 Providence Engraving aluminum pet ID tag is surprisingly inexpensive and well made at the same time. These are premium anodized aluminum tags that can be customized however the owner desired. The ID tags are made in several different shapes and can have 4 lines of text on each side. 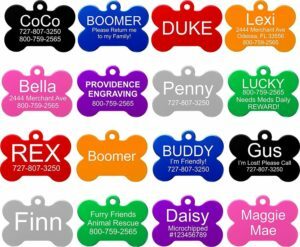 They can have the pet name, address and a contact number engraved on the tag. Customization options offer a good variation. The tags are available in multiple shapes and 8 different colors. Each tag is approximately 1 inch in diameter and can be used for both dogs and cats. 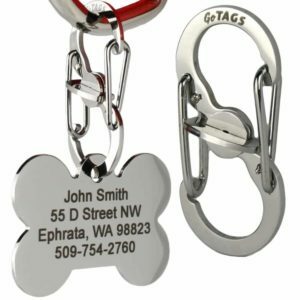 GoTags stainless steel pet ID tags are a great option for every pet owner. They are a great way of making sure a dog or cat find their way back home. The tags can be customized and were made to be as durable as possible. For the tags, the manufacturers used stainless steel with a chrome finish that protects it from corrosion. Each tag can have up to 4 text lines on the front and 4 lines on the back that can contain information such as pet name, contact phone number and a physical address. In terms of diversity, the tags are available in 9 different shapes. All of them are only available in a chrome finish. Personalization process is simple, and delivery is quite fast. Picking a dog tag can also be a matter of personal taste. Since there are so many different models to choose from, some might be more appealing than others. What matters the most is that all of them are inexpensive and can be customized to contain all the vital information. 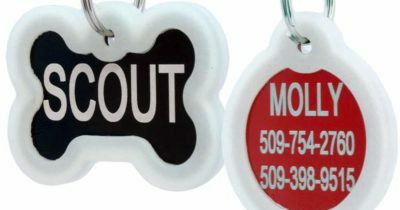 Number of text lines: Most pet ID tags can have up to 4 lines of text on one side. Usually, that should be enough. If it is not enough, some models can have another 4 lines of text engraved on the back. Shape and design: There is a wide selection of shapes and designs available. Most likely, the pet will not care about the shape of his ID tag. It is a subjective option, but it is worth noting that there are plenty of ID tags available. If one brand does not sell something good enough, there are surely others that may have a more diversified offer. Plastic or metal? 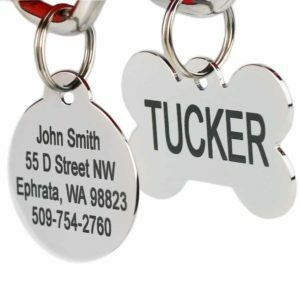 Usually, pet ID tags are made out of stainless steel and aluminum. They are durable, but they can be subject to corrosion. The plastic ones may seem like a better option, but it is worth noting that pets have an easier time chewing on them. The thing that matters the most when it comes to ID tags is for them to have the right information engraved. They should always have the pet name, owner address and contact phone number. In case the pet gets lost, whoever finds the dog or cat will be able to return it to its owner. Hopefully, the ID tag will never be needed but it never hurts to be prepared. 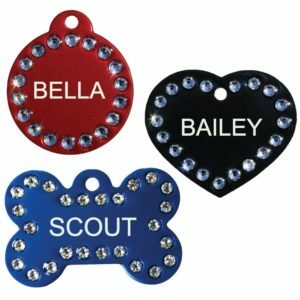 Most sellers will personalize the tags they sell with all the details provided by the pet owner. The process is quite a fact in most cases and delivery only takes a few days.